Celebrate Record Store at Rosie's BYO vinyl and we'll spin it in house. 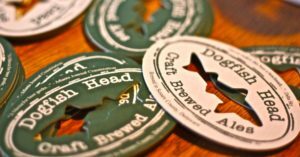 Dogfish specials and SWAG. So you got all this vinyl for record store day and now you need a sweet new Dogfish Crosley record player to spin them on. From 4/13 until 4/30 drink a Dogfish beer and enter to win a chance at a new player. Celebrate Record Store Day with a pint of Dogfish Head beer at the Pub! We'll have American Beauty, 60 Minute, and Dragons & YumYums on draft! Drink a beer. Enter to win a sweet Dogfish Head record player. Come celebrate Record Store day with Dogfish Head with us. We'll have American Beauty through two Randalls! Plus, we'll be raffling a Dogfish record player from Crosley!